At a moment in time where creatives seem obsessed with looking to the past, Brooklyn-based artist/illustrator Sougwen Chung has achieved the remarkable feat of creating her own intimately personal vision that somehow exists immaculately timeless while still remaining overwhelmingly now. There’s an inherent musicality to the improvisational drawings and 3D renderings, which is more explicit in her latest work for the mighty, Michigan-based record label Ghostly International. And yet, the overall aesthetic is always elusive, indefinite and lingering just outside conventional notions of organic form. Dazed spoke to the multi-talented drawing whiz about music, image and ‘trend-agnostic expression’. Dazed Digital: Hi Sougwen, what are you listening to at the moment? DD: What are your main sources of inspiration? Sougwen Chung: Memory, sound, narratives. Travel, music, books. DD: What sort of media do you work in? 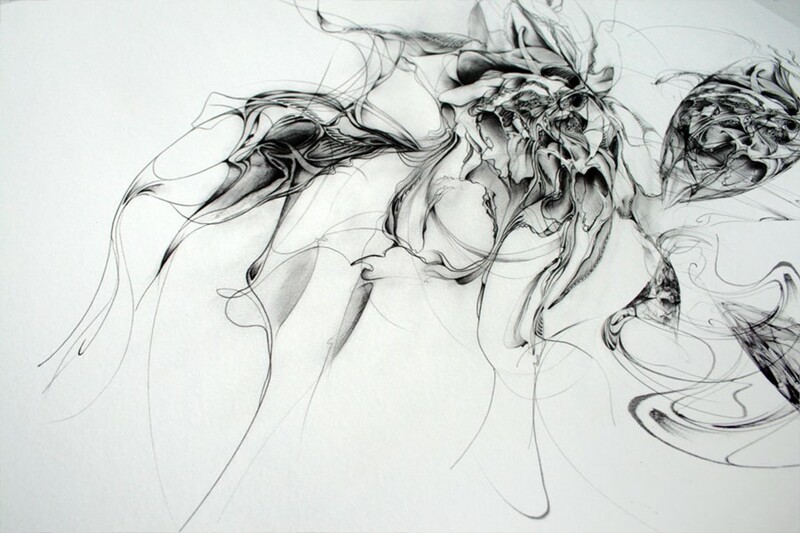 Sougwen Chung: I have a background in time-based art (music and instrumentation) However, my forays into composition took the form of drawing... simple improvisational mark-making — allowing a pen to wander on whatever surface I could find. Over the past two years, it's evolved into larger-scale graphite drawings and relatively complex 3d renderings. The interplay between instinctive mark-making, shaders and physics is definitely a space in which I will be experimenting with greater depth in the near future. DD: How much do you rely on technology to complete your vision? Sougwen Chung: It depends on the piece, but I don't personally regard it as a reliance, per-se. I take pride in being able to create work with the simplest of tools whenever I choose, allowing for a spontaneity in commune with the environment in which I am making. DD: Does your current environment filter into your art? Sougwen Chung: Yes, the physical, mental, emotional, environment impacts the work significantly, often revealing itself after the piece has been finished. DD: Do you actively strive for a sense of timelessness in your work - or does it just come organically? Sougwen Chung: I think my process lends itself to a sort of natural and trend-agnostic expression. Timelessness is the goal isn't it? I seldom look to other artists for visual cues, and when I have it feels rather phony to me, somehow. DD: What’s your favourite sound? Sougwen Chung: Drone, bass, acoustic strings. Sougwen Chung: I'm at an intersection with this current body of work and aim to focus more on experimentation in the coming months... I just recently completed a four piece series, Étude Op. 1, first of a larger body of experimental pieces. Op.1 is now available for purchase on the Ghostly Store. For the rest of 2011, live visuals and artwork with musicians Sepalcure... and who knows? Streams and updates of Sougwen’s’ latest projects can be found at: twitter, facebook, and on sougwen.com.